A lot going on throughout the NBA in a 24-hour span continues to cause adjustments to the seeding. Eighteen days until the Spurs regular season ends. And we’re going to count them down along with the current rankings and expected movements in the day’s games. 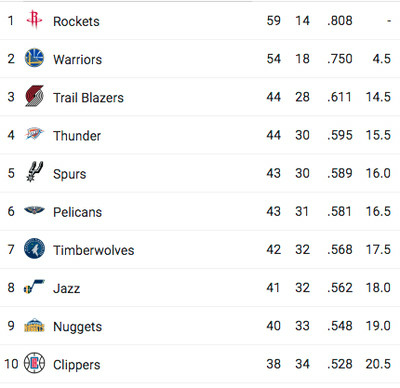 Okay, let’s get real – the Houston Rockets are pretty much a lock for first place in the Western Conference. Golden State was up there, but recent injuries have made the separation between the first and second seed a little more defined. And Steve Kerr, as well as his band of players who go back as far as 2016, are not interested in chasing wins at the expense of injury and fatigue. So let’s just write in Houston as the #1 seed. And for that matter, let’s go ahead and call the Warriors the #2 seed. As of our publication (and the exact moment is important as the scene changes constantly), there is a six game separation between the 3rd and 10th seeds, hence, all the movement. 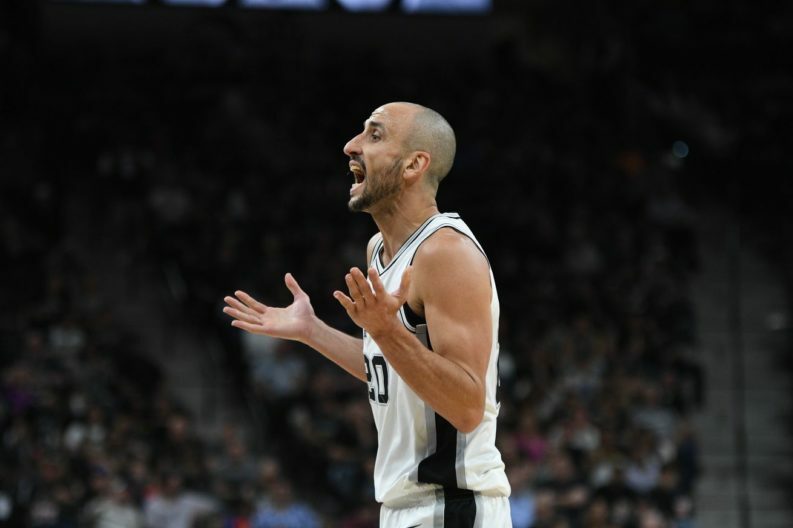 So, what games are important as we figure out where the Spurs will eventually land? Well to start with, Minnesota dropped a half game in the standings last night after a poor showing in the City of Brotherly Love. The 76ers easily sent the Timberwolves packing with their tails between their legs. That helps the Spurs to the tune of a game-and-a-half between their current 6th place and 7th. Ninety-some-odd minutes after the Timberwolves increased the divide, a Chris Paul-less Rockets hosted a Rajon Rondo-less New Orleans Pelicans. The loss to the Pelicans resulted in the Spurs and Pelicans trading places. So now you have the Spurs in 5th and the Pelicans in 6th. Must be nice to move up in the conference standings while sitting in the Hyatt Regency, eating room service, and watching “The Lest Jedi” on pay-per-view. Today, it’s get tricky. Let’s start with the Spurs playing the Bucks at 2:30 p.m. Let’s go on the premise that the Spurs win. Otherwise, why write all this up for a Spurs blog at all? So, a win for the Spurs in Milwaukee would knot up the Spurs and the Thunder. OKC currently holds the tie-breaker, so no movement in the standings, for now. But keep in mind, this is early in the day. Now at 5:00 p.m., the Clippers face the Raptors. It’s safe to say that if Doc Rivers and company suffer another loss, we can stop worrying about their odds of staying in the playoff picture, at least as it pertains to taking a spot away from the Spurs. That said, there are two big games later in the evening that should interest Spurs fans. The first is the Portland Trailblazers taking on the Thunder in Oklahoma City. IF the Spurs win AND the Thunder lose at home, then the Spurs will move into 4th place, the Thunder into 5th, while the Trailblazers maintain 3rd. BUT – if the Thunder win, then all three — Blazers, Thunder, and Spurs —stay in their respective 3-5 seeding. That said, the Thunder and Trailblazers will be the same number of games back, the only difference being the amount of games played (OKC has two more under their belt) giving Portland 2/1000 of a percentage point advantage. This becomes important as the Spurs host both teams over their final 9 games. The second game to look at is the Utah Jazz taking on Golden State in Oakland. I’m never one to root for the Dubs, but a Warriors win adds a little more padding between the Spurs and the Jazz. It’s tricky as Stephen Curry left the last game when he was injured by one of his own players. No, it wasn’t Zaza Pachulia, although that would have been poetic justice at its finest. Depending on which Golden State players suit up, the Jazz could pull this one off. Not rooting, but reserving the right to like and curse the outcome no matter who wins. Either way it shouldn’t hinder the Spurs seeding immediately, but a Jazz win could come into play at a later date. Check back daily as The Thread will keep updating.